WaveGuard & Multiplex for 2" thru. 8" discharge pipe lines. No moving parts, and no open cell foam to clog or degrade. 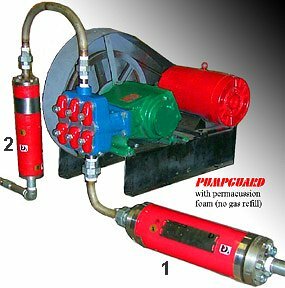 PumpGuard is for 3", 4", 6", 8", 10", & 12" suction lines. No cushion pre-fill is required. 1. The water was not pure. 3. Now the high amplitude at high frequency robbed 70% of the life from the ultra filtration membrane. ANSWER: To prevent the system response reflecting back to the pump, and from increasing the pressure spikes, a WaveGuard WAG was installed which intercepted the forcing action of the pump and isolated it from the high frequency response of the short pipe system. 1. Four times the ultra filtration membrane life. 3. The system stopped springing leaks. When a PumpGuard cavitation preventor was added to suction it, it was possible to double the flow rate by changing the driven pulley. *8.8 Meters, say 57.7 feet there and back, at 4600 ft in a second, dived by 57.7 ft. = 79.7 acoustic/pressure waves coming back onto the pump per second. They return at almost the exact instant the pump tries to send out another one. The system is an amplifier. That is one reason for RESONANCE.